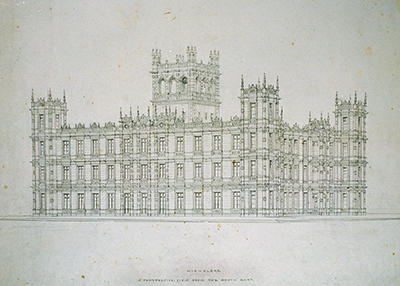 It was the 3rd Earl of Carnarvon who, in 1838, commissioned architect Charles Barry to transform the Georgian House he had inherited at Highclere into a spectacular Italianate Castle. Agreement was reached and the ceremony to inaugurate the beginning of the work with the laying of the first stone at the base of great tower took place in 1842. In pursuit of various researches, I have been gathering together Barry’s letters and drawings. The ones of Highclere are beautiful and the building is an extraordinary achievement from the pre-eminent architect of the day. Highclere has a very similar intricate silhouette to the Houses of Parliament in London and I usually quip, thankfully, that Highclere is, luckily, somewhat smaller. We have apparently 200 to 300 rooms; the Houses of Parliament far, far more with a lot more roof, corridors, staircases and central halls as well. Charles Barry had won the competition to rebuild the Houses of Parliament in 1836 following the great fire that took place there in 1834. Before he could begin he had to rebuild the river wall against the Thames using granite brought down from Aberdeen in Scotland. Unlike Highclere, the first stone was laid with little ceremony in 1840. As the project progressed various changes were made by the supervising committee. Members of Parliament tried to hold various areas to their proprietorial control and the inevitable complaints soon began about running over budget. There was a long running argument about how to ventilate the building and particular tension developed between Barry and one Dr Reid who felt he should be the one to instruct Barry. Barry was a practical engineer with extensive knowledge of building. He was experienced in how to lay foundations over marsh and quicksand and innovative uses of scaffolding and powered machinery hoists. Iron girders and sheets of iron were used in preference to wood to militate against another fire. Reading Barry’s letters, it becomes obvious that the Houses of Parliament, for all their success, gave him little pleasure and he became very stressed and tired. 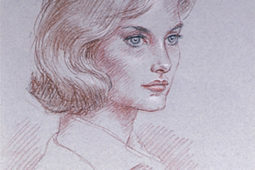 Highclere seems to have been a happier commission. There are letters of dispute to builders here but expressed, thankfully, with more courtesy! Very interesting! I always enjoy your blogs! Love to read about all the history of Highclere! It is such a fascinating place! Thank you for this interesting blog about the design and construction of Highclere. I remember seeing the very first episode of “Downton Abbey” and taking special notice of the “castle”.It was so unlike the usual historical English houses that are in TV period dramas and films, and yet it was so familiar an architectural type ( me being an ol’ art history buff). 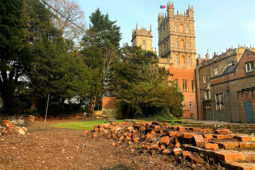 ‘Hit “locations” on the Abbey site and discovered Highclere Castle and that began a love affair with the place! It does reflect Barry’s architectural elements of the House of Parliament, but it is, oh, so much more elegant and regal in its natural setting. ‘Fortunate to have visited Highclere during the April private tour, and seen the glorious interior, I always have to chuckle when it is mentioned that Highclere Castle has “200 to 300” rooms…still haven’t counted them all? hee, hee. Would you ever consider plans to make a section of the castle into private overnight suites / boutique hotel? How thrilling it would be to be able to sleep up in the rooms of the towers!!! Catherine, one of your last lines is exactly what I was thinking….200 to 300 rooms? Such a broad range, ah? While never having had the experience or responsibility of living in such a huge residence, I’d like to think I would have mounted a “counting party,” to ascertain just how many rooms there are though I realize that would be quite the effort! I would so appreciate it if Lady Carnarvon would elaborate regarding why the range is so broad and whether or not what were the rooms for the many servants back in the day are included in that figure, or is she just referring to the number of rooms of just the main residence? Thank you Lady Carnarvon for such an interesting blog post! I would make yet another vacation to the U.K. to be able to stay a night or two at Highclere Castle. I entered the PBS contest again this year, but alas, did not win. However, I would make yet another vacation to the U.K. to be able to stay a night or two at Highclere Castle. Therefore, I vote for a bed and breakfast/hotel room also. We would never be a hotel – no lifts, or elevators… no fire escapes (just fire shutes) and actually the wear and tear on the building would destroy it. We have auctioned the odd night staying with us for charity and I am proud of how much that has raised and contributed to good causes. Staying at London Lodge has been a huge success and I think there is fun to be gleaned from other quirky properties on the estate. The great central tower is amazing and the views glorious whatever the weather. As an english language tutor in the state of São Paulo, Brazil,I am advising and recommeding this sight seeing to my students who are local university professors and professionals to International Industries. This is such a beautiful atmosphere with a beautiful historical castle and aamazing well written history told in beautiful english. We need quality and culture combined with tourism. What a very interesting story ! Lovely to know this history ! Thank you very much, Lady, Carnarvon. I find this sort of research interesting. The scope of designing, building, furnishing, and equipping, a castle, intended to be family home, is fascinating to me. I’d also find a narrative of the logistics, and process of the beginnings of Highclere to be very good reading. Would you be able to actually count the number of rooms that exist today? I would enjoy reading a comparison of the existing rooms to original number, of intended rooms. Also the modern uses of those original rooms. These are my fundamental thoughts: in order for Highclere to survive today, to find a role in a different world from which it was built, I try to find a an identity for the rooms and for the different parts of the Castle. I am working my way up the Tower as I think I have found it! What a glorious sight Highclere is when first approaching it! I was fortunate to have visited with a group of friends in May on the Bank Holiday Monday. We toured the house, gardens, and many of us saw the Egyptian exhibit as well. The architecture is truly magnificent, and now that I know its connection to the Houses of Parliament, of course I can see the resemblance. What a lovely day we had visiting this architectural gem of England. Thanks to the family for opening up your wonderful home. I hope to visit again some day soon. Thank you Lady Carnarvon for your blog! I love reading everything about Highclere. It is truly a fascinating place and I hope to see it one day! I love the blog and I did get to meet you Lady Carnarvon when we were on Viking River Cruise tour. Would not change a thing it was a wonderful experience to see you and the dogs. Would do it again in a heart beat. From Florida! I just love learning this bit of historical info and yes, I can really see similarities. Your blog, Lady Carnarvon, is always a joy to read and I am so glad you share your delight in your home with us! And these blogs certainly will add to the written material about Highclere and its owners. Thank you very much for taking time to do this. I really enjoy your blogs, it seems closer to my heart since I just visited coswald village. We are now on the Viking river cruise enjoy the week. Greetings, Lady Carnarvon, from hot and steamy Florida. I enjoyed reading about the architect Barry and his commissions to rebuild Houses of Parliament and to transform Highclere into something even more remarkable! The sentence about the hauling of granite from Aberdeen to London struck me. What a challenge that must have provided the architect and those working with and for him. I am interested in knowing how that was managed and how long it took to haul those heavy granite pieces. I enjoyed reading your blog (as usual)! Very informative! I am beginning to know a little more about the Houses of Parliament and just so enjoying it. I agree – I found it fascinating that the granite was brought down from Scotland and very unifying. 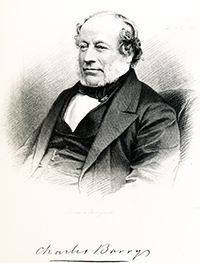 The building of the Thames wall and the construction of the foundation was a tribute to Barry’s engineering skills. VERY interesting blog! LOVE anything to do with architecture….hope you would consider writing a book on the building of Highclere…I will be the first to order a signed copy! If you are ever in the US again I would highly recommend a visit to the Winterthur estate in Delaware. Beautiful house and gardens. They hold Point to Point races there in May (I believe it’s May). Also Longwood Gardens here in Pennsylvania is a really great place to visit. They have some of the largest and most beautiful greenhouses in the country and they are quite old (probably Victorian). It all started when a wealthy American named DuPont didn’t want some big trees cut down so he bought the entire area. The rest is history as the saying goes….I hope you can visit someday! I would love to visit some day – I have a list of houses and gardens I would like to see in the States! I hope you and all fellow bloggers are well. What an interesting history, Highclere has. 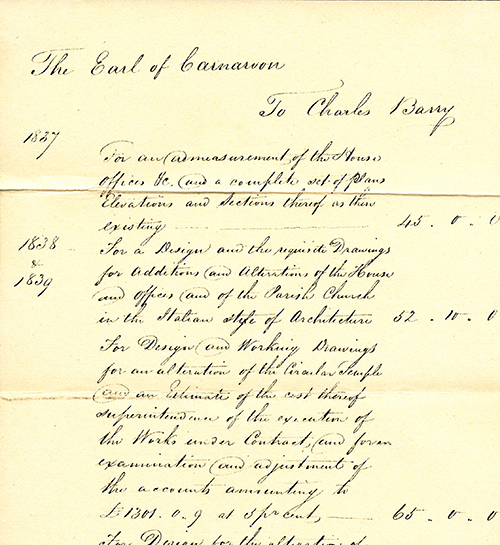 It is wonderful that the letters and drawings of Sir Charles Barry are still in existence (and in such good & safe hands). I believe that Halifax Town Hall also was designed by Sir Charles. I recall being told that Sir Charles had been requested to simply judge the design entries but didn’t like any of them. As a consequence he was invited to submit his own design, which he did and, as they say, the rest is history. 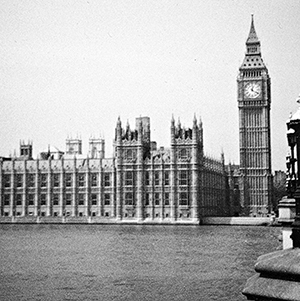 Apparently, his son, Edward, completed the project on his father’s death, as he also did with the Houses of Parliament. By the way, I agree with Mary Beth; a publication of the diagrams, letters and a commentary/editorial (by your good self) would surely comprise a “best seller’. I am pursuing that very purpose! I need to assimilate the detail and then I hope to write something more 3-dimensional (is how I think of it) about the people who made these buildings and spaces. I love the nuggets found in the papers here, just a line sometimes and you can see the character. Wow, interesting! Fascinating story. Thank you for sharing Lady Carnarvon!! Dear Lady Carnarvon: Thank you for your spectacular and informative blog. I have long been a devotee of all things English, and of course have loved Downton Abbey and beautiful HiClere Castle. I am now on your mailing list and will be savoring each post. I am, however, very sad at the moment, as my friend Brenda and I have been waiting to book our 2016 Paris & the Heart of Normandy cruise with Viking for September next year. They have been advertising the extended Oxford and Highclere Castle (the Real Downton Abbey), for some months in conjunction with this particular cruise in their many and ever arriving literature. We have been told by their booking agents that we should not book until the confirmation of the contract for this particular HiClere extension was received which was expected some time in June. This afternoon we received a call telling us that this particular cruise for 2016 will now not offer this very special HiClere extension, for what reason we know not. We are heartsick, as you can imagine. We were so looking forward to meeting you, and taking the behind the scenes tour of the Castle, to say nothing of meeting your charming dogs. We spent ten days in England last year as part of amarvelous trip, but were unable to book a tour of the Castle due to that schedule. Since Viking has so disappointed us, we are hoping that prior to heading for the continent and a September 11, 2016, departure on the Viking Normandy cruise, that we will at least be able to book a tour and tea with HiClere. I see from looking at the current scheduling that the Castle closes around September 10 this year. Any information regarding the 2016 openings would be greatly appreciated. We would be able to immediately provide credit card information to reserve a tour time between September 3 to September 10, 2016. We will be most grateful for any assistance you can give us in booking this tour for next September. We will definitely be open in early September so that will not be a problem. You could stay near here and visit Oxford or Winchester as well. 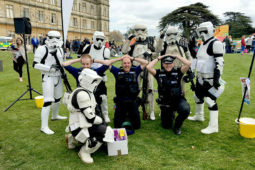 Or you could head down towards Bath and stay at Bowood house which we also have a great partnership with too. HighClere. Also, if the castle is closed would your High Tea’s or Gift Shop be available? From watching Downton Abbey, my favorite view of the Castle is the long driveway approach. There was a stunning photo of David and Lauren Bush Lauren in the perfect spot to be in awe and to appreciate the exquisite architecture of Sir Charles Barry. I believe Highclere to be his Masterpiece Classic! Good evening Lady Carnarvon. One the approach to the Castle from the drive, there are the two magnificent trees, one on the left and one to the right. I was wandering what type of trees they are. I live in Zimbabwe and am unfamiliar with the trees of Britain. I have recently started watching the Downton Abbey series, and am thoroughly enjoying the grandness it holds. I hardly watch TV but when I saw Downtown Abbey I just fell in love with the beautiful castle; its gardens and driveway. It takes you to an era one never lived and its amazing. I love the majestic aura of castles and palaces. I still remember the thrill I felt at the idea of visiting the castle one day and to experience the feeling of living in such a beautiful place which is your home. I live in Turkey and I might be coming to London this August and hopefully will see Highclere castle on this trip. I would be delighted to meet you in person. Would there be any articles anywhere I could read on that, or any archaeological features to be visited? I’ve always wondered about the fact that in “Downton” it is called an “Abbey”. A bit similar to past reality though rather modest since there was a medieval palace owned by Bishops there. Would you happen to know where I could find more information on that?